Tokyo Disneyland is both familiar and unique all at the same time. While they have many similar rides to their American counterpart, it’s like they took all the good rides at Disneyland and then refined them so that the experience would be even better. Queue lines are just a bit more atmospheric, and the attractions seem a bit more polished. The castle is definitely bigger in Tokyo and the walkways are broader, too. 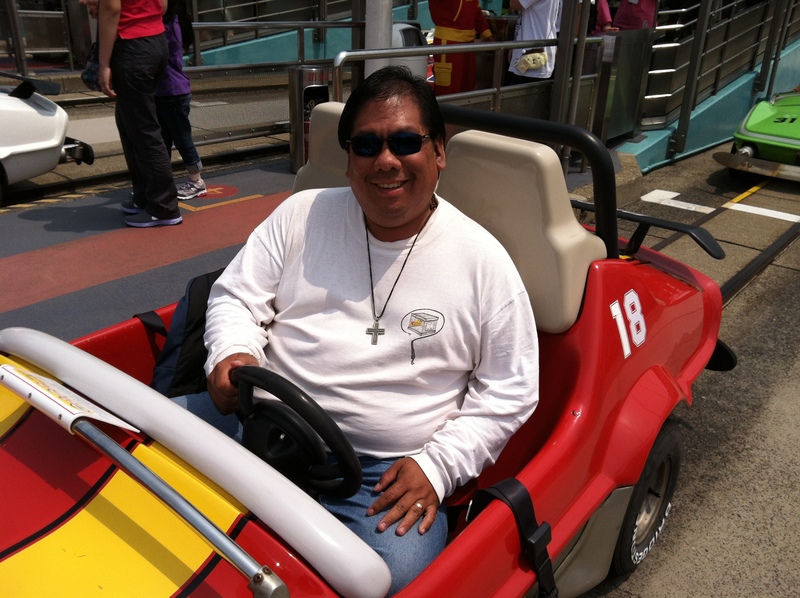 Enjoying the Autopia like a kid again! Some of the attractions in Tokyo don’t have the enhancements Disneyland has. For instance, in the Haunted Mansion, while similar to it’s Disneyland counterpart, seemed stuck back in the 1980’s. The ride was great, but everything was so retro! They still had the bride with the pulsing red heart in the attic as opposed to the talking and seemingly holographic bride in California. Same thing with Pirates of the Carribean. While they did incorporate Jack Sparrow, I found it interesting that in the “chase” scene, it remains as it was originally with the men chasing the women (except for the woman at the end still chasing the guy). And the Autopia doesn’t have those cool little “off road” experiences like the one in Anaheim. Star Jets at Tokyo Disneyland while similar to the old Rocket Jets have a style and flair of their own. They do have rides here that they no longer have in some of the parks. They still have Country Bear Jamboree with all three original productions which they rotate on a regular basis. I saw the Country Bear Vacation Hoedown which was great! Even in Japanese. 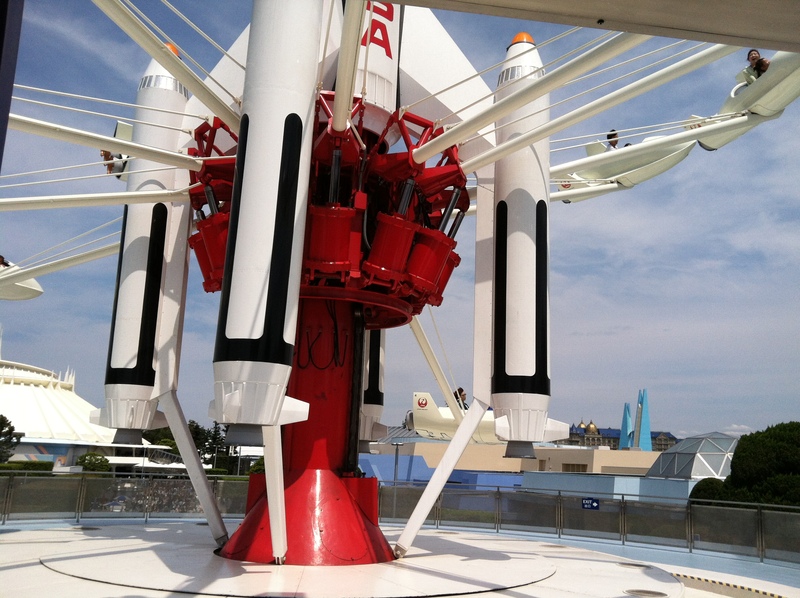 They also have the Rocket Jets (called Star Jets in Japan and sponsored by Japan Airlines). The ships themselves look quite a bit different but the concept is exactly the same. Check out our post about It’s A Small World around the world to learn more! Of course, Tokyo Disneyland also has it’s own unique attractions. Monsters, Inc. Ride and Go Seek is an interactive dark ride. Shining your flashlight on the targets activate different surprises all along the route. It’s pretty innovative and fun but can be hard to see everything when you’re trying to concentrate on zapping your light. Still it’s very much worth your while! Pooh’s Hunny Hunt is also a Tokyo Disneyland exclusive also (and quite a bit better than either Pooh attraction in the US). It uses trackless technology to guide your hunny pot through Winnie-the-Pooh’s story. Different pots give you different experiences so you can ride it multiple times and enjoy something new each ride. But it’s more than just trackless. My favorite part is when your whole hunny pot jumps up and down with Tigger! Make sure to get a Fastpass for this ride as they go fast. Their most recent addition is another Stitch feature – Stitch Encounter. It was just about to open when we visited in 2015 so we didn’t get a chance to experience it, but it’s modeled after the one in Hong Kong. From what I’ve read it’s similar to Turtle Talk with Crush or Monsters, Inc. Laugh Floor. Fastpass tickets go even faster in Tokyo than in the US, so plan ahead and get yours early. Definitely Monsters Inc. and Pooh’s Hunny Hunt are ones to grab as soon as possible. If you are staying at the hotels and do the Happy 15 (15-minute early entry into the park), my recommendation would be to go to Monsters, Inc. first, then to Pooh’s Hunny Hunt and when the park opens get a Fastpass for either one of those attractions, Space Mountain, or Thunder Mountain. Thunder Mountain had by far the longest line I saw at the park. I love Thunder Mountain as much as anyone, but wow! The lines were super long! Bud budget your time correctly and you’ll have an amazing time. For more about the attractions at Tokyo DisneySea click on the link. To read about meals and snacks at the Tokyo Disneyland Resort click on these links. Previous Previous post: An American in Tokyo Disneyland – Tokyo Disney Sea Attractions!